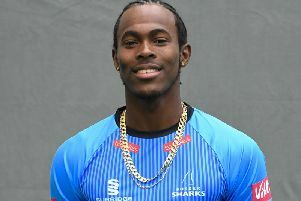 Former Eastbourne player and Sussex batsman Luke Wells believes the return of IPL stars Jofra Archer and Chris Jordan is a huge boost for their crunch match against Essex at the Saffrons on Sunday. Sussex Sharks are back at the Saffrons for the second time since 2000, where they welcome Essex Eagles in the Royal London One Day Cup. The weather forecast is good and a capacity crowd of 5,000 is expected as Jason Gillespie’s team need a victory to help them qualify for the knockout stages. Archer and Jordan were due to return in Sussex’s one-dayers at Gloucestershire and Surrey but both matches were abandoned due to rain. They are set to play at Glamorgan today (Friday) and then against Essex. Wells said, “It’s great to have them back, They are world class performers. CJ has been great for Sussex and Jofra has just flown to the top of the sport. He is now one of the best fast bowlers in the world. Wells, 27, was born in Eastbourne and played his club cricket at the Saffrons and at Seaford before making his first-class debut for Sussex in 2010. The left-handed top-order batsman is the son of ex-England player Alan Wells and the nephew of Colin Wells, both of whom also played for Sussex. Luke has gone on to score 6,760 first class runs for his county with 18 centuries to his name and 26 half-centuries. He has mainly featured in the Championship but this season, Wells has been given his chance to shine in the one-day format. “I have been at Sussex a while but I have not played too much white ball cricket. I enjoy it and I’m really looking forward to playing at the Saffrons. I enjoyed my time at Eastbourne. My dad coached there and my brother played for them so I have a close connection, it’s a great club. To get a crowd of 5,000 will be great. Match starts 11am. Tickets are available online: wwwsussexcricket.co.uk and on the gate.